The first sound recording device, which ended up as a Record Player, was made by a Frenchman named Edouard-Leon Scott de Martinville. It was patented on March 25th, 1857. It could record sound, however it could not play back sound.n 2008, the recordings used from this machine were finally able to be heard. a record player had to have a needle if it didnt the record player could not work. .If the record has a scrach try and not let the needle get close to it. 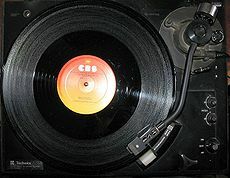 .If the record sounds crackly and has scraches clean your needle but make sure you dont break it. .If the needle is broken go to a replace ment shop or a online shop.